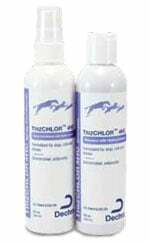 You are buying the Dechra TrizChlor 4HC Spray Conditioner For Cats Dogs Horses 8oz Each, model #TCCHW. At ADW Diabetes, we offer a wide selection of Dechra products for cats and dogs. Shop with ADW Diabetes and save on all of you pet health care and grooming supplies. The Dechra TrizChlor 4HC Spray Conditioner For Cats Dogs Horses 8oz Each is for support of healthy skin for animals with conditions respnsive to chlorhexidene. Hydrocortisone helps promote relief for itchy skin. Effective against multidrug-resistant staphylococcal infections. Use in conjunction with Muricin (2% mupirocin Ointment on focal areas of infection).